I recently had the pleasure of meeting Leah DeCesare at Byrd’s Books in Bethel, and she couldn’t have been nicer. Sweet, funny, and personable, I knew I needed to read her book right away. The book is a breath of fresh air, much like its lovely author. The clever premise drew me in from the first sentence and the endearing characters found their way into my heart. As Amy York is leaving for college at Syracuse University, her single father gives her advice in the form of a metaphor. 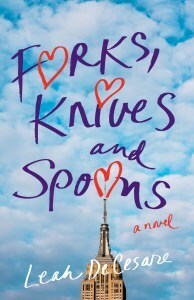 He tells her there are three types of guys: forks, knives, and spoons. The forks are the jerks, the spoons are the nerds, and the knives are the good guys. Amy takes this advice to heart and tells all of her new friends about the Utensil Classification System, adding new utensils as needed. The ideal guy is the perfect steak knife: smart, strong, and confident. As Amy and her best friend, Veronica, navigate their way through college and beyond, they meet their share of utensils, leaning on each other for support along the way. As they mature and learn from their experiences, they learn that a person or relationship can never be defined by one simple word. The classification system changes as they grow, becoming more nuanced and subtle than it was when Amy’s father first imparted his wisdom. I enjoyed travelling with Amy and Veronica on their coming-of-age journey. The girls are both interesting and well-developed characters, and the friends and boys they meet keep the story moving along nicely. Also, because the story is set in the 1980’s, references to music, movies, hairstyles, and fashion add an amusing touch. Allusions to teased bangs, stirrup pants, Meatloaf, The Divinyls, When Harry Met Sally, and Footloose, amongst many others, had me chuckling out loud and remembering my high school years. This is a perfect summer read, light and breezy, but with important lessons that kept me thinking well after I finished the last page. For more information about the author and book, visit leahdecesare.com.